Mr. Joong Keun Shin says he wishes for unification in a peaceful way. He and his schoolmates fought for South Korea side by side with American forces. During the war, he recalls, he swam in freezing water, walked in knee-deep snow wearing only underpants and shoes, and watched friends die. 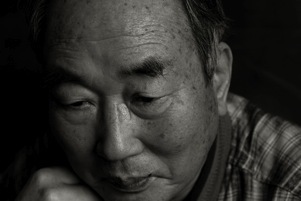 Mr. Shin was attending a selective school in South Korea when the Korean War began. He returned home to Ongjin on the border of North and South Korea in October 1950, but returned to South Korea on Jan. 14, 1951. Whenever he and his schoolmates have reunited in South Korea in recent years, they recall their classmates — about one-third of them — who were left behind in the North. His happiest memory was being accepted to his school. He says he was the only one from his elementary school selected. He also fondly recalls the taste of a caramel type of candy and noodles that his grandmother made for him. He is sad that he can’t visit his grandfather’s gravesite in North Korea. Tagged divided, essay, family, Korea, North. Bookmark the permalink.